"A very simple to make bar cookie that kids love. 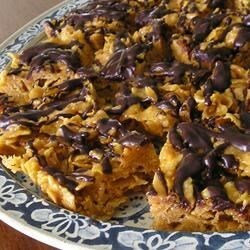 Sort of like a peanut butter rice krispie treat, except made with cornflakes." Cook syrup and sugar until mixture comes to a boil. Stir constantly; do not overcook. Remove from heat, add peanut butter, and stir until smooth. Pour mixture over cornflakes in a large bowl. Mix until cereal is thoroughly coated. Spread in a buttered 9 x 13 inch pan and press down lightly with buttered hands. When cool, cut into squares. I grew up on this recipe! They used to serve this to me at my public elementary school cafeteria. I have made this recipe for a long time by dropping it from a spoon in clusters! In order to add more crunch to it, I use Frosted Flakes instead of plain ole' cornflakes. Yummy. Great! I use 8 cups instead of 10, less dry!